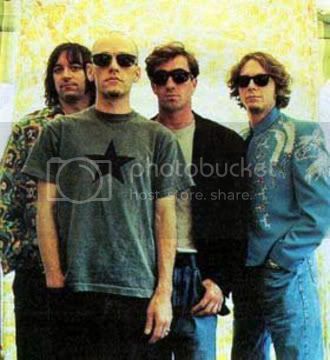 Legendary American rock band R.E.M. announced today they have officially disbanded, bringing to a close an unlikely 31-year run that saw them rise to the unlikely height of being one of the biggest bands of their era. "To our Fans and Friends: As R.E.M., and as lifelong friends and co-conspirators, we have decided to call it a day as a band," they said in a statement released on their web site. "We walk away with a great sense of gratitude, of finality, and of astonishment at all we have accomplished. To anyone who ever felt touched by our music, our deepest thanks for listening." The news has sent shockwaves across the internet and throughout the music world as the band remained respected and beloved despite their waning commercial clout at the end of the '90s and into the 21st century. Michael Stipe, Mike Mills, Peter Buck, and Bill Berry formed as a quartet in Athens, GA and their debut record Murmur remains one of the great debut records of any band of any era, perhaps because it didn't hint at the massive success that was to come rather than in spite of it. The four of them would go on to sell tens of millions of records together before Berry retired to go home to his farm in Georgia in the mid '90s, after which the other three carried on. The post-Berry era was never as commercially successful but the 2008 album Accelerate and resulting tour seemed to return the wind to their back and the band seemed poised for a nice run as elder statesmen with a loyal fan base. Their indispensible Live At The Olympia, recorded prior to the release of Accelerate but released after, even seemed to hint they were ready to bring their glorious past with them as they raced into the future. Anyone whose actually paid attention to R.E.M. has to know that's something they'd never have any interest in and despite proclaiming this year's Collapse Into Now their best record since 1991's Out Of Time, they opted not to tour in support of it. Not many bands become famous by not touring but R.E.M. sat out their two biggest records Out Of Time and Automatic For The People and never cashed in on what surely would have been a string of sold out shows in arenas and stadiums worldwide. They did things their own way and on their own terms as much as any band on a major label ever has. R.E.M. were never a punk band in sound and not even really in persona but there was a certain attitude of "you can't make us" that seemed to permeate. Their decision not to tour Collapse may have been a mild surprise given the effort they seemed to put forth in rebuilding the brand with Accelerate but that's the R.E.M. way and no one really took notice. No one saw it as a sign the band's days would soon be numbered and they were right not to, except that it apparently is. Stay tuned to BlindedBySound, where you can bet we'll have more to say about one of the great bands that simultaneously stood for something and mattered.